Unique bird feeders will delight you and your wild birds. 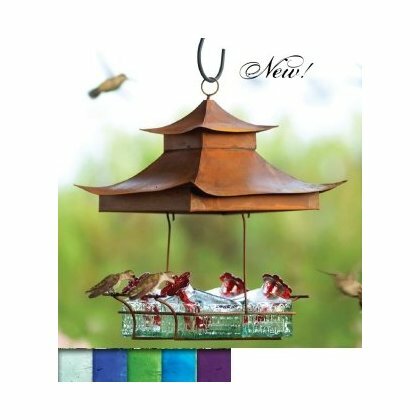 Gazebo bird feeders, humming bird feeders, metal bird feeders and more best backyard bird feeders tips. 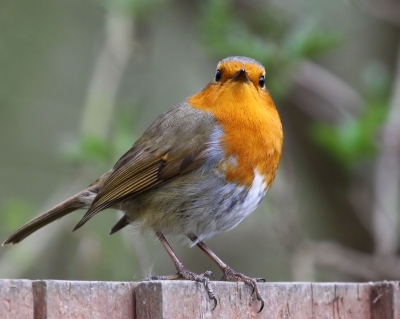 Feeding birds in your garden can be as exciting as you want to make it! Choosing unique bird feeders to put in strategic spots make your garden a pretty picture for you and your friends. And the birds will reward you with repeat visits! What I love about the range of different feeders available, is that you can really get creative about making your garden an extension of your own style. Almost any unique feature can be used in some way as a feeder. And it does not need to be expensive! Indulge your passion as a wild bird spotter and just have fun! Spread the Fun and share your unique bird feeder tips with all of us! 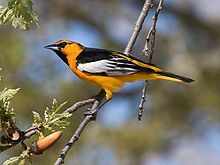 The exciting thing is that, with a bit of knowledge, you can attract different kinds of birds to share your backyard with you. Attracting particular birds and keeping them coming back to your backyard will be determined by where you live, and the time of year. A good idea is to start with a wooden platform above ground level. Experiment with different bird seed and pieces of fruit. Observe which birds are in the neighbourhood before you spend money on a unique bird feeder. 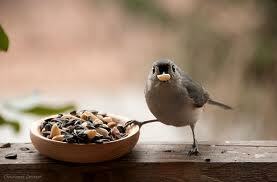 No point in buying a feeder that only holds peanuts if your visitors are mostly small birds. I find that a general purpose feeder will keep most common garden birds happy throughout the year. Choose a spot that is easy to get to. When the weather is bad and birds need feeding the most, you just may not feel like wading through mud to fill a feeder that is not in a convenient spot. Also, pick a spot where dropped seed shells and bird droppings won’t be a problem to clean up. If you have squirrels in your neighborhood, they will visit your feeder. Don't hang anything from a tree branch if you don't want to feed the squirrels. A squirrel-proof feeder or a feeder on a pole with a baffle is the best solution. What about a fun bird feeder for hummingbirds? 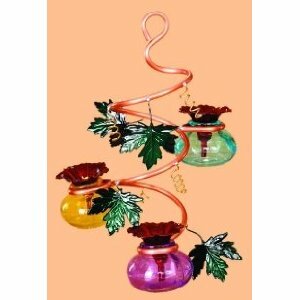 The most popular hummingbird feeder is flower shaped, red or pink colored and usually plastic. I enjoy viewing hummingbirds at a window bird feeder. Long-lasting and sturdy metal bird feeders are always a good addition and make great gifts. I had a really hard time choosing just 2 "best" feeders - so have given you more choice than usual. I hope you find one that you just have to have in your garden! Hanging Bird Feeder "Copper Spiral"
Made in the USA, this unique birdfeeder consists of solid copper that spirals that create a functional garden artwork! Two interlocked "swirls" create a tray for the birdseed as well as an overhead baffle to shelter the seeds and birds. Includes an attached copper hanger. The roof is large enough to protect the seed from most rains. But if the rain blows into the seed holder, the drain hole and design of the feeder allow for very fast drainage. It will weather to a nice green patina. 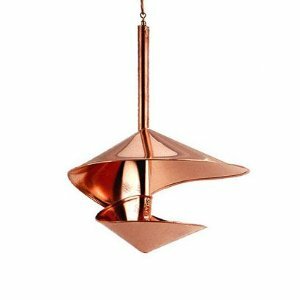 Click here to order your Hanging Bird Feeder "Copper Spiral"
I love this unusual feeder! It is Pagoda style with a rustic tin roof that shelters the specially designed basket weave feeder. I like the design, the durability of the glass and the metal perches. And it also got a thumbs-up from my feathered garden friends. Add a work of art to your garden! This is a solid piece of wall art with much more detail than shows in the photo. Made of cement resin mix, it can even be used indoors. Comes already with holes in the back for hanging. Star embellishments decorate the moon's face. 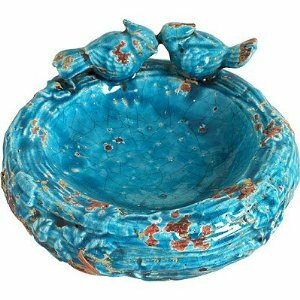 Attract birds with this elegant ceramic bird feeder and beautify your garden space! It is a really attractive design with two birds perched on the rim. Finished in glazed blue color, you can fill it with seed and fruit. Or use as a bird bath. All I can say is that is so pretty! 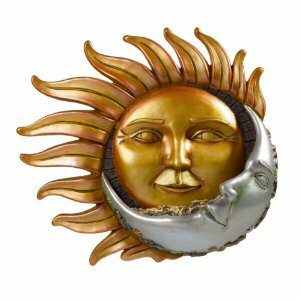 It makes a great gift for any bird lover and adds charm to a garden or patio. Even when the birds are not visiting - which they will - the colours and shape make a lovely focal point. Medium-sized songbird with long tail and rather thin, straight, pointed bill. One large or two small wingbars on each dark wing. Orange or orange-yellow. Adult females have grey-brown upperparts, duller yellow on the breast and underparts, and an olive crown. Forages in trees and bushes. Feeds on insects, caterpillars, fruits and berries. Sips nectar. Found in deciduous woodlands, shade trees, riparian woodlands, parks, and towns. Will feed off oranges and other fruit. Both males and females sing. Conservation status - numbers appear to be stable.